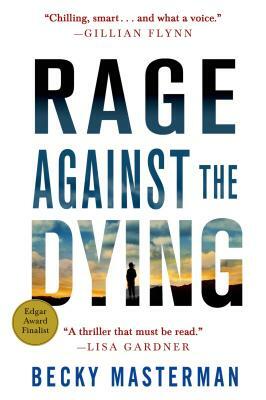 Becky Masterman’s debut novel Rage Against the Dying is a hair raising mystery set right in our back yard. Pushed into retirement, former FBI agent Brigid Quinn and her husband are starting to settle down in Tucson and live a quiet life. Brigid has decided retirement isn’t so bad and is starting to rather like her quiet life , but then her past finds her. Now she finds herself involved with an old unsolved case that was rather gruesome and horrific. A man has come forwarded claiming to have been the Route 66 killer that Brigid spent years searching for. He evens tells the FBI that he knows where Brigid’s missing protegee has been taken and will help them find her. Of course, the new FBI agent on the case believes the confession to be a fake, leaving it all up to Brigid to once and for all close this deadly case. Materman’s writing style is compelling. She weaves in and out of the past and present flawlessly, making the reader unable to put the book down. She also uses multiple narrators to tell the story, giving you a complete look at what is happening. This book has a few graphic and intense moments that will both make you both cringe and keep reading to find out what happens. I was utterly immersed in the story from the first paragraph and all the way through the book. And of course, I loved that it took place in Tucson. Somehow it just makes the story that much better when I know the setting. Be sure to get Masterman’s novel, this is an author to start looking for. Brigid Quinn's experiences in hunting sexual predators for the FBI have left her with memories she wishes she didn't have and lethal skills she hopes never to need again. Having been pushed into early retirement by events she thinks she's put firmly behind her, Brigid keeps telling herself she's settling down nicely in Tucson with a wonderful new husband, Carlo, and their dogs. But the past intervenes when a man named Floyd Lynch confesses to the worst unsolved case of Brigid's career—the disappearance and presumed murder of her young protégée, Jessica. Floyd knows things about that terrible night that were never made public, and offers to lead the cops to Jessica's body in return for a plea bargain. It should finally be the end of a dark chapter in Brigid's life. Except…the new FBI agent on the case, Laura Coleman, thinks the confession is fake, and Brigid finds she cannot walk away from violence and retribution after all, whatever the cost. With a fiercely original and compelling voice, Becky Masterman's Rage Against the Dying marks the heart-stopping debut of a brilliant new thriller writer. BECKY MASTERMAN, who was an acquisitions editor for a press specializing in medical textbooks for forensic examiners and law enforcement, received her M.A. in creative writing from Florida Atlantic University. Her debut thriller, Rage Against the Dying, was a finalist for the Edgar Award for Best First Novel, the CWA Gold Dagger Award for Best Crime Novel of 2013, as well as the Macavity, Barry, and Anthony awards. Becky lives in Tucson, Arizona, with her husband.